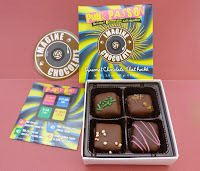 Today's Punk Passion assortment box from Imagine Chocolate/Imagine Flavor, Inc. (Studio City, CA) contained four different flavors, each inspired by a different song and group. "London Calling" (a 1979 hit by The Clash) was up first. This milk chocolate peppermint center with peanuts, covered in milk chocolate, and topped with green sprinkles, was my favorite piece in this Punk-influenced collection. 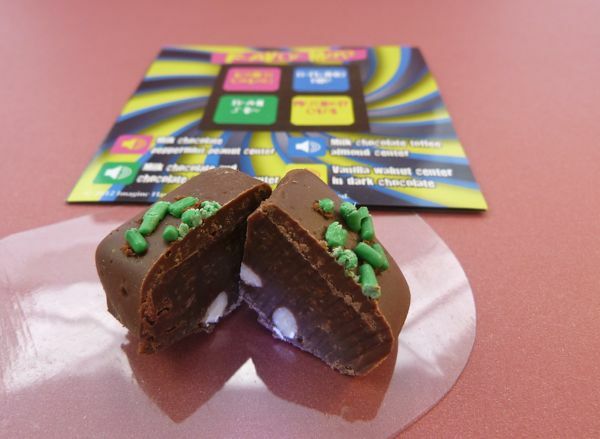 The hint of peppermint gave this chocolate a punch and the peanuts gave it a bit of a crunch. Next, I tried "Blitzkrieg Bop" (a "fast, loud, and fun" hit by The Ramones from 1976). This milk chocolate toffee almond center in milk chocolate with sweet, but lacked full flavor I'm used to with higher end toffee creations. I loved the excuse to listen to "Blitzkrieg Bop" again though. 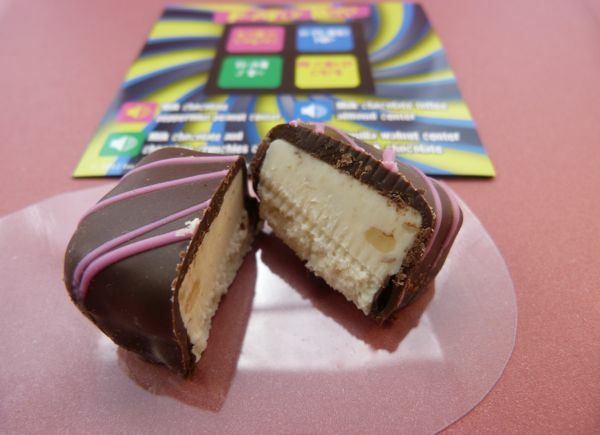 The third chocolate in this 4-piece box was "Personality Crisis" (an early punk hit in 1973 by the New York Dolls) had a vanilla walnut center covered in semi-dark chocolate, and decorated with pink icing. Often vanilla nut nougat centers are too sweet for my taste, but this one was about right, and the semi-dark chocolate coating helped balance the sweetness. Last, was "Brain Stew" (referencing a 1995 hit track from Green Day's Insomniac album). This milk chocolate with (white) chocolate crunchies in milk chocolate was a bit mellower than the other chocolates in this group, except for a slightly crunchier texture. 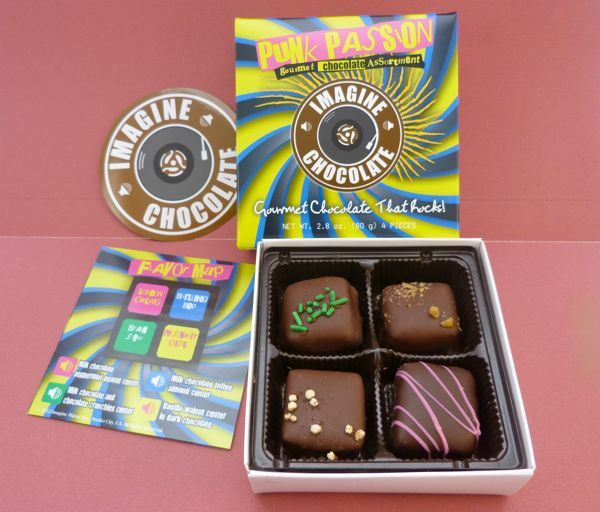 The company's music-themed chocolate collection boxes are available through school fund-raisers, and are being updated over time to capture the latest hits. Today was Day #4 of Chocolate and Music/Audio Theme Week.